Although in-school programs are available at the high school level, our most popular and exciting JA high school program takes place outside of school. 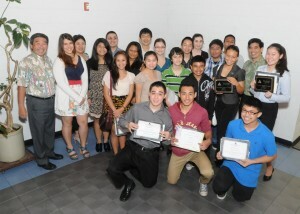 JAHI’s high school Company Program is the only one of its kind in the State of Hawaii. The hands-on program runs annually from September through December. The students, from Freshmen to Seniors and from most all East Hawaii high schools start by going through a job interview to be accepted by the program. Those who are hired are then assigned to a company team, sponsored by a local businesses and advised by local business people. For 15 weeks the Companies meet each Tuesday evening. They elect officers, select company names and create brands, develop product ideas and then manuacture, market and sell their products. (Sales in previous years for four companies totalled over $60,000.) Throughout the program teams account for their expenses and revenues, manage their time, deliverables and human resources, and also perform community service activities. they purchase up front for two-dollars multiplies based on the company’s success, often earning more than a 200-percent return. Like the real word, JAHI assesses taxes on all JA-Company earnings. However in JA all taxes paid go back to the students as prizes and scholarships. For more than 20 years Junior Achievement of Hawaii Island has provided scholarships to high school seniors based on applicant’s academic achievement, extra-curricular activity involvement, community service and leadership skills.